Internships have become the currency of early career success. Skills gained during short work experiences are often key when employers decide who gets their foot in the door, and they are also the best way to find out whether a particular industry aligns with your career goals. I have recently spent 3 months at a biotech startup, and couldn’t have enjoyed my time there more! The company I worked with has just been founded and is developing products for stem cell science and regenerative medicine — two explosive markets with huge amounts of revenue and projected growth. The combination of these factors — the culture you’ll find at startups that have just been founded and the possibilities of a newly emerging and fast growing market — have completely shifted my perception of the biotech market. 1. You don’t have to have a science background to work in the biotech sector. Before my internship, I believed only biologists worked in the biotech sector. I couldn’t have been more wrong. Yes, on the R&D and production side of things, a life sciences degree will be needed, but that’s just one part of the company. Any good biotech startup also needs people who are experienced in sales and marketing, communication, business development, and finance and accounting. Software development and graphic design is also high in demand for many companies trying to build their brand. If you’ve always been interested the sector, but thought your background prevented you from it, dismiss that idea now! While the products might be different, the daily grind on the office side of things is very similar to any other industry. If you have experience with any of the areas listed above, you could soon be an invaluable member of the team. 2. The pay is almost guaranteed to be above average. Generally speaking, any biotech companies need lots of capital injected in the beginning since production costs tend to be much higher than in other sectors. If everything runs smoothly, revenues are also very high. This shines through in the salary of the employees. 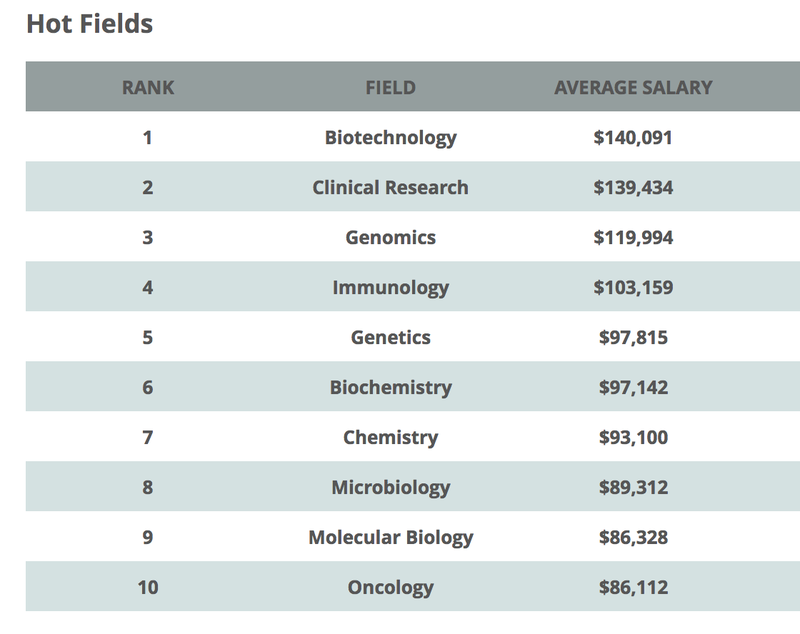 Biotech industry professionals earn more than other life science professionals, and if averaged across different positions, regularly lead income rankings across the country. 3. Taking risks is good. Once they’ve made it, biotech startups are incredible places to work at. However, getting there is slightly harder than it is for your typical tech startup: it can take years for the first biotech products to hit the market, and they often have to pass a lot of strict and costly regulations beforehand. This fact, in combination with the already somewhat fickle nature of the life sciences sector, makes biotech a very unpredictable business. However, that also means that it’s a place like no other for learning the flexibility and the guts needed to dramatically alter the direction of a company. Often, when things don’t work out, it’s not a question of tweaking them until they do, but completely realigning the entire strategy. That isn’t just the complete opposite from what I’ve learnt at all other work experiences so far, it’s also the key factor that made my work so exciting. During my internship, I’ve learnt a lot of things — from customer base management to market research and product design. But what will stick with me the most are these three key insights. I would not have known about these things without interning at a biotech startup. And while I don’t know yet whether future career steps will carry me into this sector, I’m sure hoping I’ll get there.